Lights that illuminate the underwater world, mounted on outrigger spreaders, on the transom or under the hull, have aided anglers for decades in powering-up nighttime fishing, calling up baits and the fish that forage on them. The new generation of underwater lights, aimed straight down or horizontally, are more reliable and electrically efficient. They add action to a nighttime trolling spread with the flip of a switch. They also look really cool when fired up at your dock. The new generation of underwater lights use Light Emitting Diodes, or LEDs, that operate at lower temperatures, use less energy, tolerate vibration better, operate with DC voltages and last far longer than conventional incandescent bulbs. They also don’t contain small amounts of toxic mercury, an environmental disposal hazard associated with fluorescent and compact fluorescent lamp (CFL) lights. Several mounting styles allow underwater LED fixtures to be mounted on boats ranging from a small runabout to the largest megayacht. We even sell lights for stand-up paddleboards, which stick to the bottom of the board with adhesive or suction cup mounts. 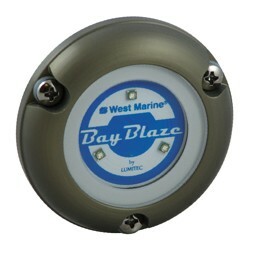 Surface mount underwater lights are often mounted on smaller powerboats and sailboats. They require only small holes for their power cables, and small mounting screws. They can be transom-mounted or located on the hull’s side, depending on the individual light and its characteristics. Brightness of these surface-mount lights is limited, due to their modest size and the amount of metal heat sinking needed to keep their LEDs cool. Installation is simple, just connect to a DC power source, a fuse and a switch. Trim tab: These lights are attached to the trim tabs on the stern of smaller powerboats. As with surface-mounted lights discussed above, brightness is limited by these lights’ small size. Installation is simple, as above. Drain plug: This type of light screws into the drain plug of small powerboats. Drain plug-mounted lights are very easy to install, with no need to drill holes in the hull, but only connect to DC power via a fuse and switch. 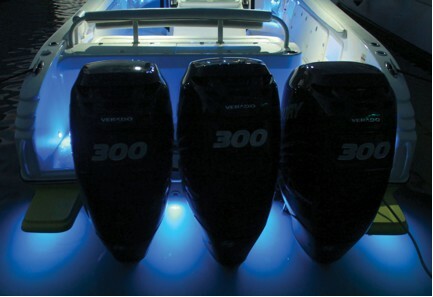 Thru-hulls: These are mounted on larger powerboats that require the brightest underwater LED option. They require a larger hole (1" diameter and larger) to be drilled into the hull to insert the stem of the light. It is necessary to haul the boat to remove and replace these lights. Designed for transom mounting only. 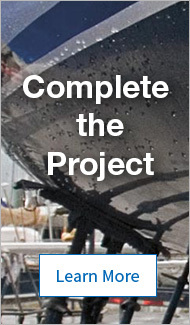 Interchangeable Thru-hull: Interchangeable means the light array can be serviced (removed and replaced) from inside the hull with the boat in the water. The hole for these fixtures’ stem is larger, so this fixture type is installed on larger powerboats. Most thru-hull fixtures of both types include an external driver box to operate the LEDs efficiently on DC and AC voltages. When mounted on a metal hull, they require an isolation sleeve installed to protect the hull from galvanic corrosion. These fixtures need to be attached to the bonding system of the vessel. Designed for transom, side and bottom mounting. 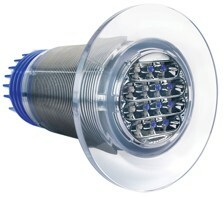 Aqualuma Gen IV Thru-hull Underwater Lights can be replaced or upgraded from inside the boat. There is no need for a haulout. The distance that a light will shine under water is proportional to the brightness of the underwater LED light. LED fixtures are normally rated in Lumens. The beam angle of the underwater light determines how the light beam appears around the hull. Available in Narrow Spot (less than 90°) or Wide Flood (greater than 90°), which produce an even glow of light and allow lights to be spaced further apart on the hull. Different colors throw light better in differing water conditions. Blue is the most enjoyable color in a wide range of water conditions. Green works well where the water is highly silt-laden, or on inland waterways. White is well suited over shallow, sandy bottoms. Red makes the water come alive. Multi or color-change lights with limitless color options are available to match your underwater lighting experience to the water conditions, fishing patterns or simply your mood.